Serendipity seems to take us on many unexpected paths in life. A perfect example is story of Erin and Jordan Nuccio. As a young man, Erin had no intention of pursuing a career in winemaking. Instead, he was eagerly anticipating the start of culinary school and happened to land a job at a prestigious wine store in the Washington D.C. area. A passion for wine was soon ignited, and he became the manager of the store. Erin soon met Jordan, an aspiring veterinarian and romantic interest, and the pair moved to the northeast as Erin explored the distribution side of the wine business. It was to be the first stop on a journey that would eventually land the couple in the Willamette Valley. With two dogs, two rabbits and a cat in tow, Erin and Jordan headed west to Berkeley, California. The couple wasn't enamored with the college town, but they made the most of their time there, with Jordan exploring holistic veterinary medicine and Erin enthusiastically immersing himself into winemaking and viticulture in nearby Napa and Sonoma. It was the wines from Oregon, however, that stirred Erin's interest the most. With Oregon's Willamette Valley calling, the menagerie was loaded into the car once again, and off they went. Shortly after the move, Erin was fortunate to meet Russ and Mary Raney of Evesham Wood Winery. The Raneys took Erin under their wing and he worked three harvests there, developing his skills as assistant winemaker and consummating a long-time smoldering love affair with the Pinot Noir grape. Most significantly, he learned to craft wines with elegance and nuance, signature qualities of Evesham Wood wines. 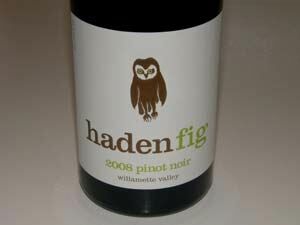 As luck would have it, Erin's launch of his own label, Haden Fig, coincided with the outstanding 2008 vintage in Oregon. 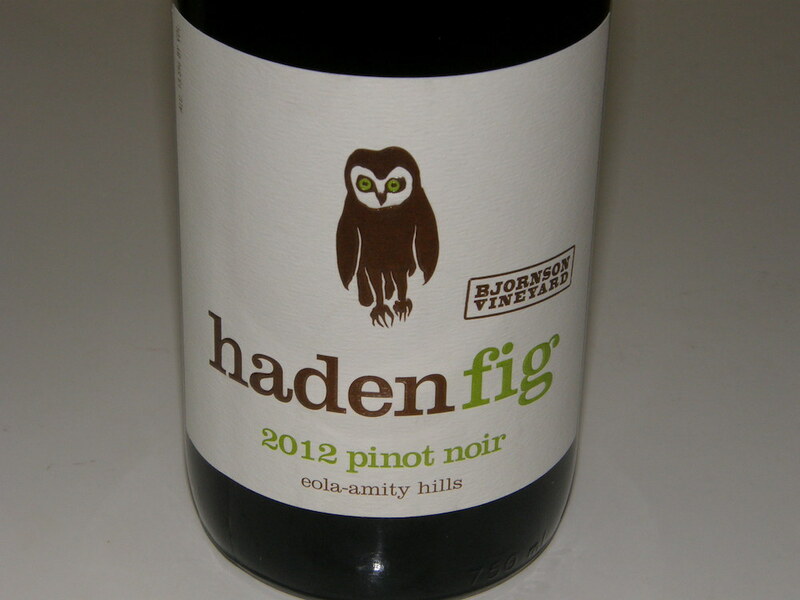 His hip label features a painting of a Northern Saw-whet Owl artfully created by Eli Halpin. Jordan Nuccio had become enamored with this owl while working at the Portland Audobon Society as a volunteer veterinarian. The Saw-whet Owl is a natural predator for small rodents in the vineyard, sometimes residing in nearby nesting boxes, and a symbol for sustainable agriculture. The name is derived from the sound of the owl's call which is said to resemble a saw being sharpened with a whetstone. 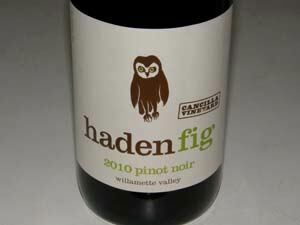 The name Haden Fig is curious to say the least, and I asked Erin how the name originated. He said, "When it came time to name the winery we were up to our ears in baby books trying to pick the perfect name for our soon-to-be-born baby boy. This was an enormous and exhausting task, but finally the name Haden came to us. I am not sure if we had stumbled upon the name of our winery or the name of our son, but it stuck in both cases. As for the 'fig' component, this might have been a subconscious homage to Mark Twain and his Huck Finn. It just sounded right, and it has become the name of a dream realized." The wines are available on the website.